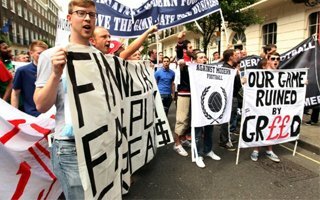 On August 14 supporters from across England will demonstrate in London, showing their outrage with pricing policies at Premier League clubs. Some season tickets have risen by 30-40% for the upcoming season and only Manchester City offers any season ticket below £300. Football Supporters Federation is preparing for their second large demonstration against skyrocketing ticket prices. First one took place last year and fans managed to force some changes. Each club was granted £200,000 to reduce ticket prices. Then again, new season shows this was only a temporary and rather futile change as 13 of the 20 Premier League sides raise their prices again. Record leap will be witnessed in Burnley, where season tickets are 47% more expensive than last year. While the team may argue changes were obvious after their recent promotion from Championship, another promoted team Leicester City didn’t go as far in lifting prices. On average a Premier League side has to spend £526 to watch an entire season of football, a 6.5% increase from last season. Only a handful of clubs keep their prices low. While Aston Villa, West Bromwich and Leicester offer a season for around £350, it’s Manchester City setting an example for others, pricing cheapest season tickets at £299. Of course the amount of cheap tickets is scarce, but compare it to Arsenal’s £1,014 for the cheapest seat and you’ll know City are doing something right. To better understand the outrage of English fans one should check prices in early 1990’s, when the hyperinflation began. In 1990 one only needed £4 to see Liverpool, one of the most successful teams worldwide. Today that fee grew by 1,150% and stands at £46. This is precisely why the FSF wants to make a stand in London on August 14. Will they be able to make a long-term impact remains unclear. But fan groups from across the country are announcing their presence as organisers hope to see at least 1,000 people attend.